Join our community and get the best thinking on nutrition, training and other factors that help you maximize your health and performance. 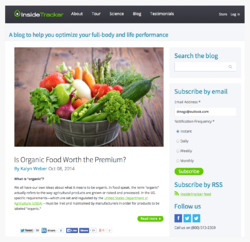 The InsideTracker blog is curated by our team of athletes, scientists and nutritionists. We research in depth the latest science on food, training, diets and technology and bring it back to you in a simple, understandable way. We interpret the facts and debunk the fads to help you make the best choices.